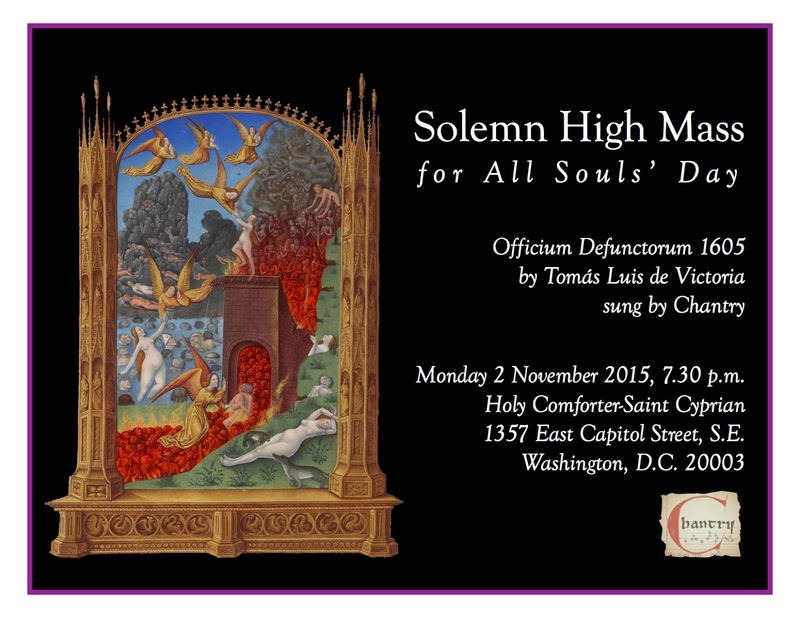 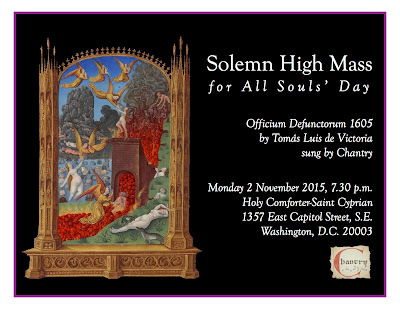 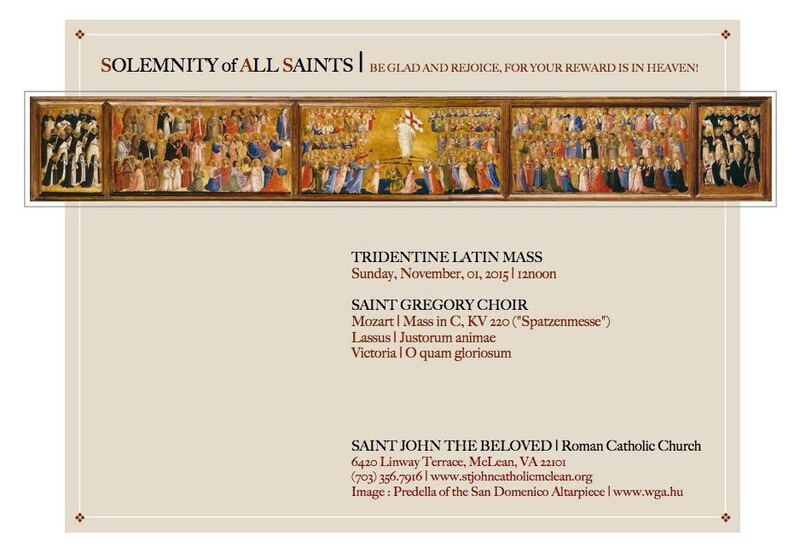 We have received and are posting a large-than-usual number of liturgical announcements for All Saints’ and All Souls’, with a lot of great music by composers like Victoria and Mozart. 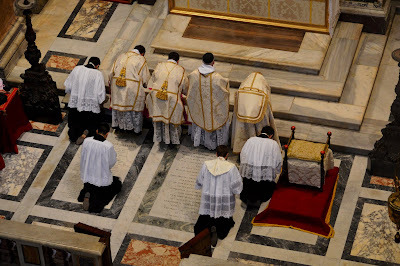 This was the case last year as well, when Ben noted à propos of this the words of Sacrosanctum Concilium, “Zeal for the promotion and restoration of the liturgy is rightly held to be a sign of the providential dispositions of God in our time, as a movement of the Holy Spirit in His Church. It is today a distinguishing mark of the Church’s life, indeed of the whole tenor of contemporary religious thought and action.” (no. 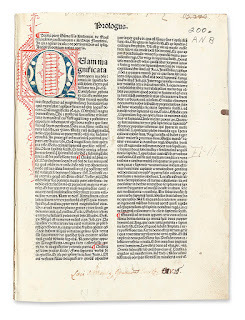 43) If only this had remained true longer than it took the ink with which it was written to dry! 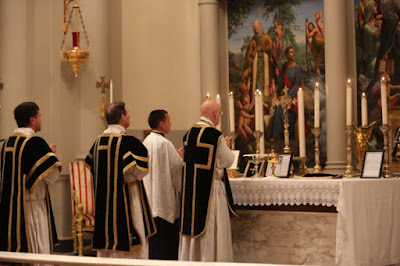 So it seems to me at least that these requests, which show a desire not only to do the liturgy well and beautifully, but also to share the experience with as many people as possible, are a sign of something very positive happening in the Church today. 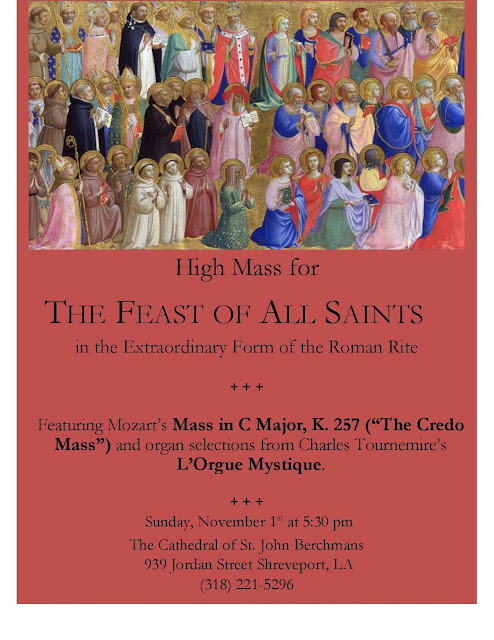 Of course, in far too many places good music is still the exception in church, not the norm, but events such as these are less rare than they were 30 years ago, and will continue to become more common. 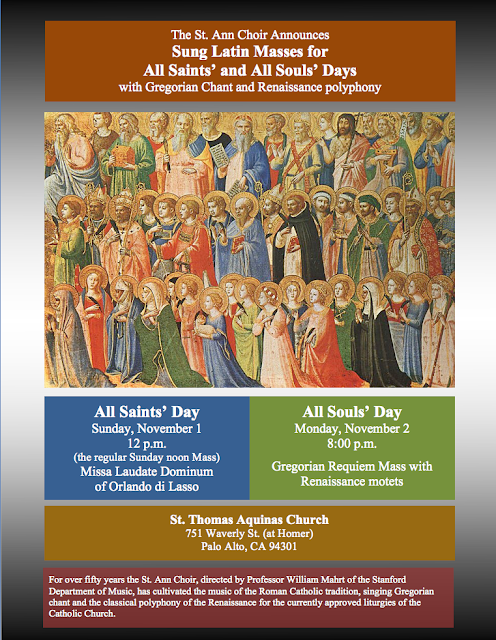 If you have the opportunity to go to such a liturgy this weekend, remember to say a pray for those who would love to attend something like it and cannot. 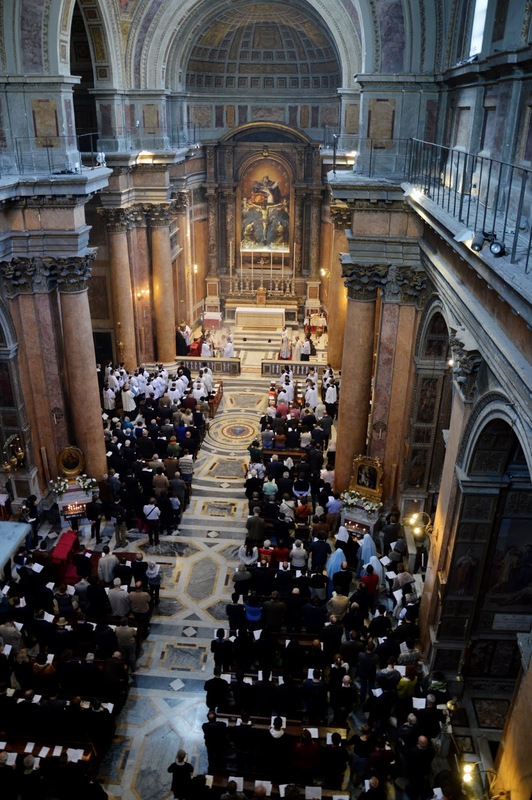 On Sunday, November 1, at the Church of the Archconfraternity “del Soccorso all’Arenella” (piazzetta G.Gigante), 5:15 p.m, Eucaristic Adoration and recitation of the Rosary; 6:00 p.m., Missa cantata celebrated by Don Andrew Southwell. 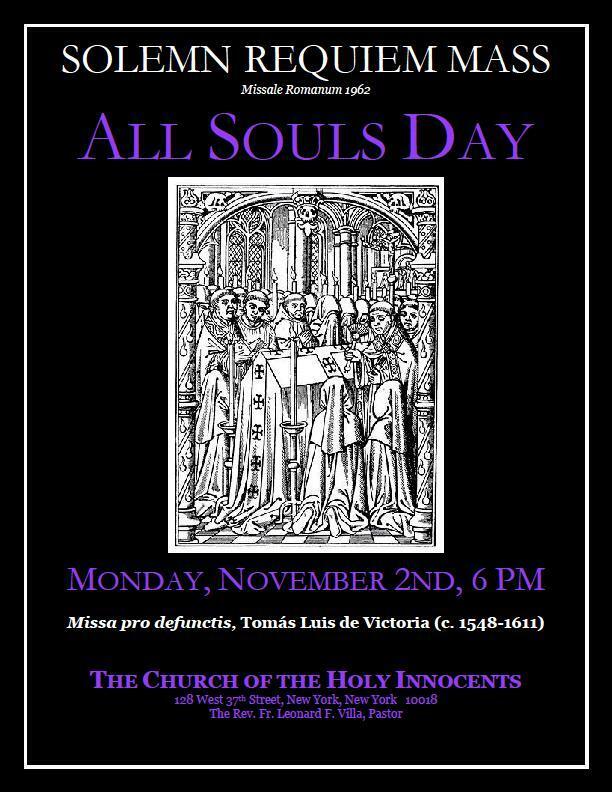 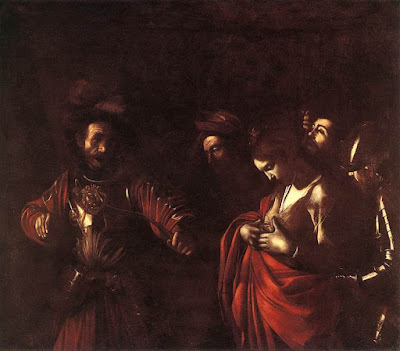 Monday, November 2, at the Church of St Mary of the Souls in Purgatory (S. Maria delle Anime del Purgatorio ad Arco, via Tribunali 39), 5:30 p.m. Missa cantata, followed by the Absolution at the Catafalque, celebrated by Don Andrew Southwell. 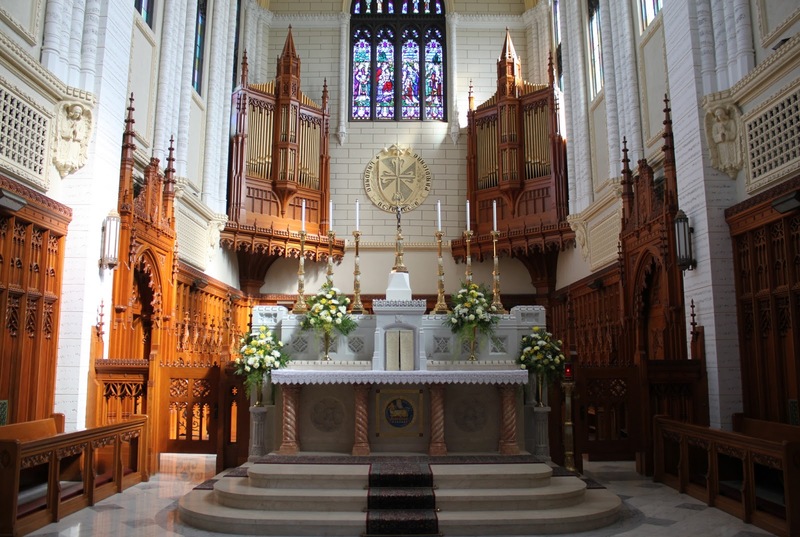 The Traditional Latin Mass Community of Philadelphia will celebrate the feast of All Saints at the church of St Edmond, where a regular EF Mass has been held every Sunday at noon since July. 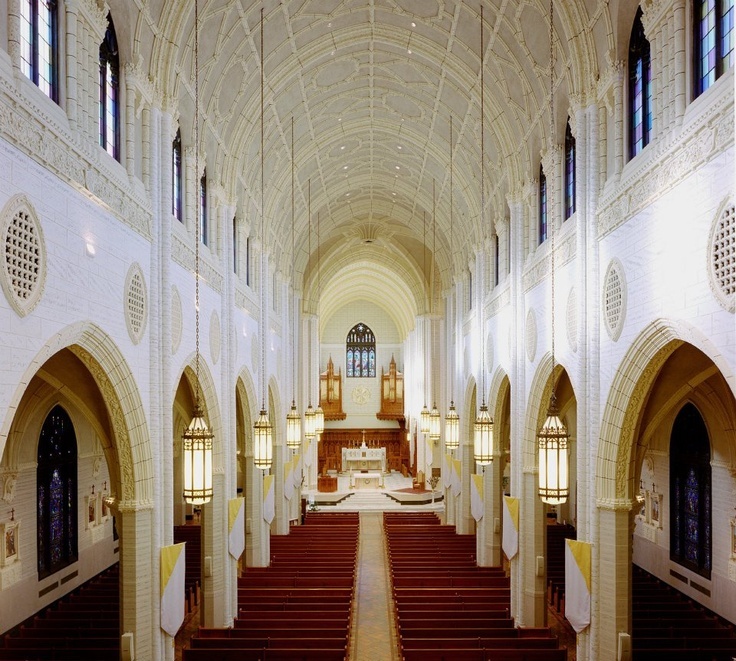 Click here for their website, and here for directions to St Edmond. 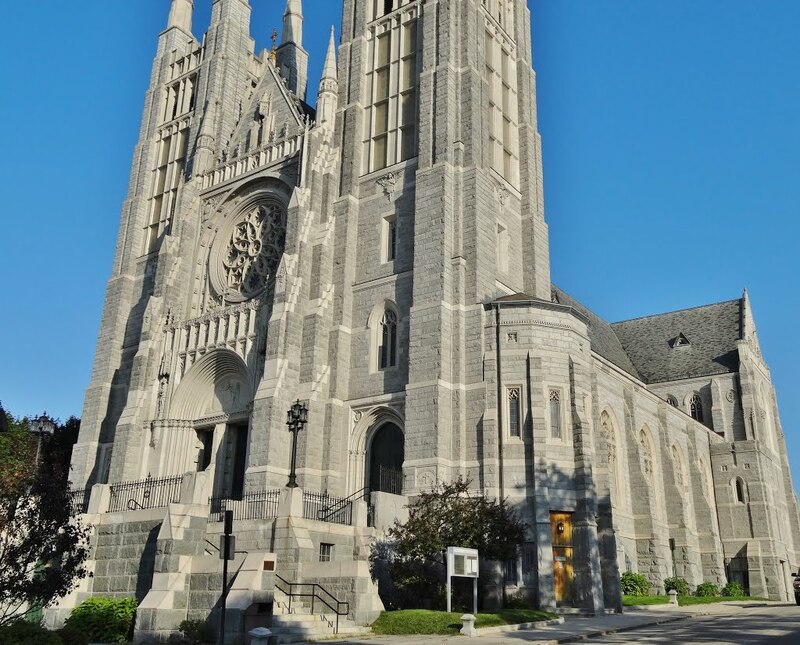 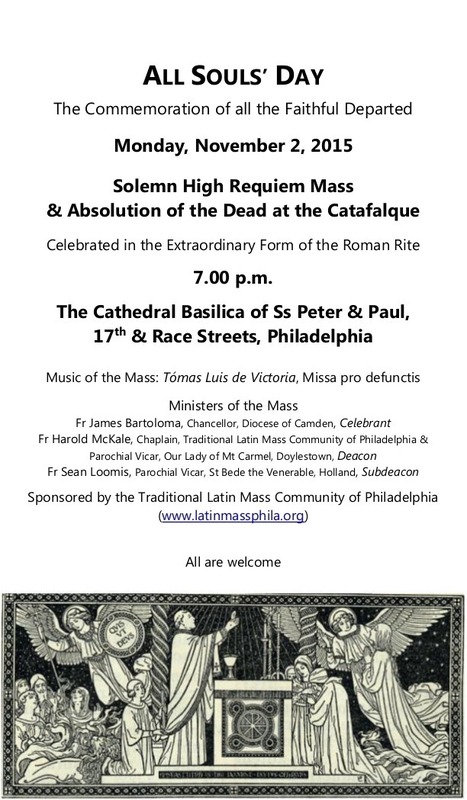 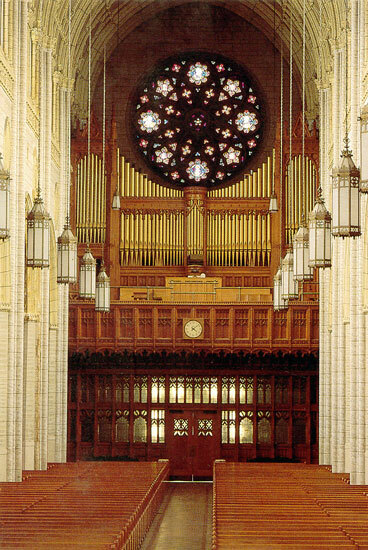 In addition, for the Commemoration of All the Faithful Departed, a Solemn Requiem Mass, followed by the Absolution at the Catafalque, will be celebrated at the Cathedral Basilica of Ss Peter & Paul, (17th & Race Streets,) starting at 7 p.m. 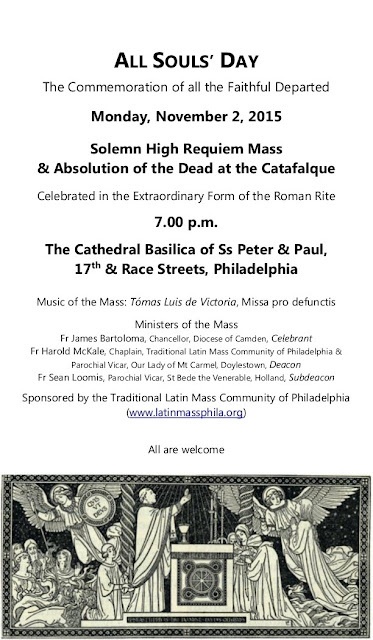 Details in the poster below. 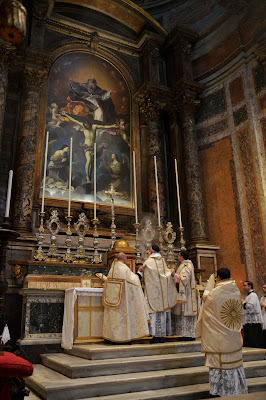 This past weekend, the Populus Summorum Pontificum Pilgrimage to Rome was celebrated once again, coinciding with the end of the Synod on the Family, and the EF feast of Christ the King. 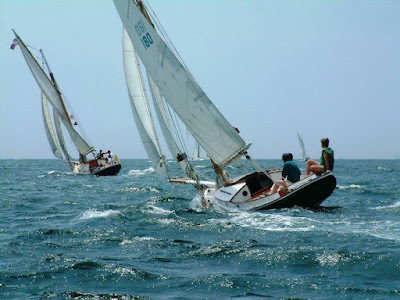 Mr François Nanceau has been kind enough to share links to his photo albums of the events with us, and give us permission to reproduce some of his pictures here, to which I have added to a video. More pictures tomorrow! 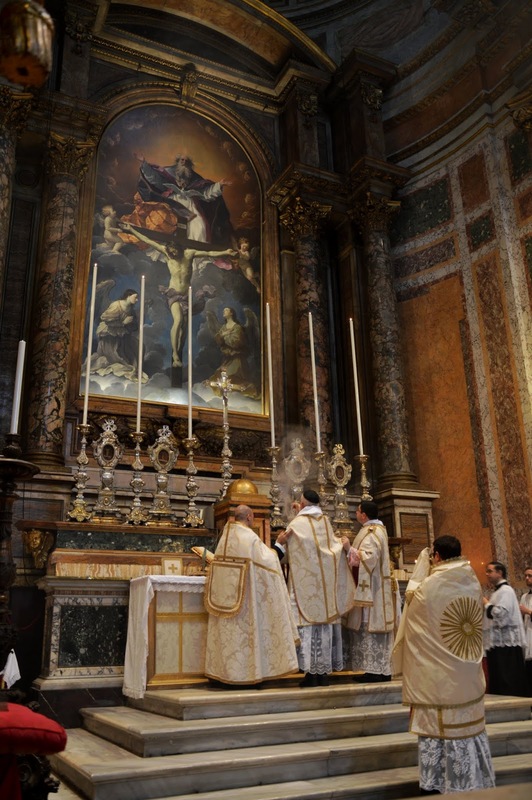 Friday October 23rd - Pontifical Mass celebrated by Archbishop Guido Pozzo, Secretary of the Ecclesia Dei Commission, at the Church of Santa Maria in Campitelli. The Mass of St Anthony Maria Claret was said, with music by the Schola Sainte Cécile, conducted by our own Henri de Villiers, singing Marc-Antoine Charpentier’s Mass for Four Choirs. 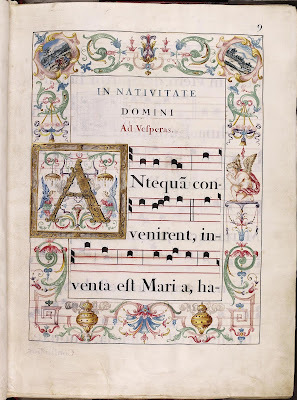 (The video with a recording of the Kyrie is below the third picture.) 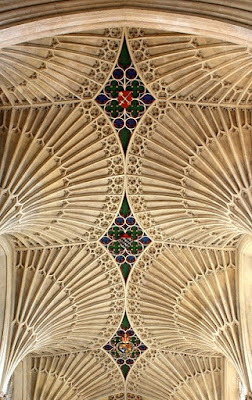 Click here to see more photographs, and here to find them on facebook. 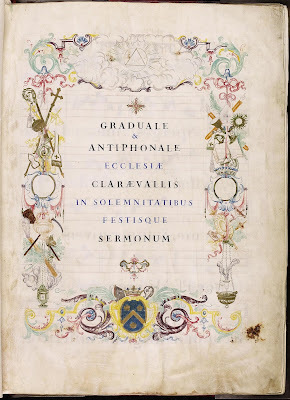 We are pleased to present the audio of a recent talk on the forthcoming liturgical rites for the Personal Ordinariates erected under the auspices of the Apostolic Constitution Anglicanorum coetibus. The talk was given by Archbishop J. Augustine Di Noia OP, Adjunct Secretary of the Congregation for the Doctrine of the Faith, and Chairman of the Interdicasterial Working Group Anglicanæ Tradtitiones, to the 2015 Ordinariate Festival of the Personal Ordinariate of Our Lady of Walsingham in Westminster, London. 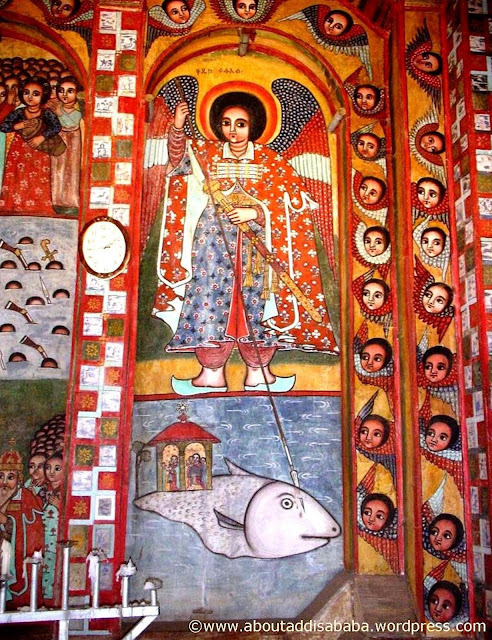 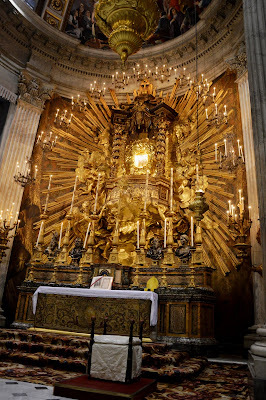 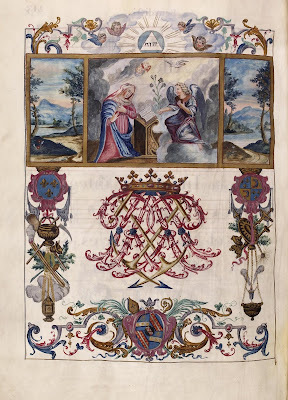 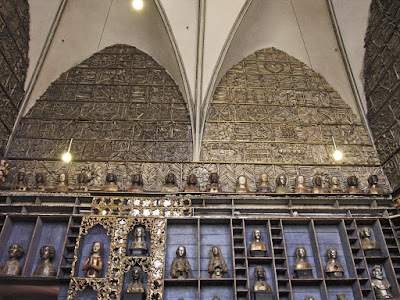 The paper is entitled “Divine Worship and the Liturgical Vitality of the Church.” It is presented here with an overview published on the blog Thine Own Service, republished here with the author’s permission. 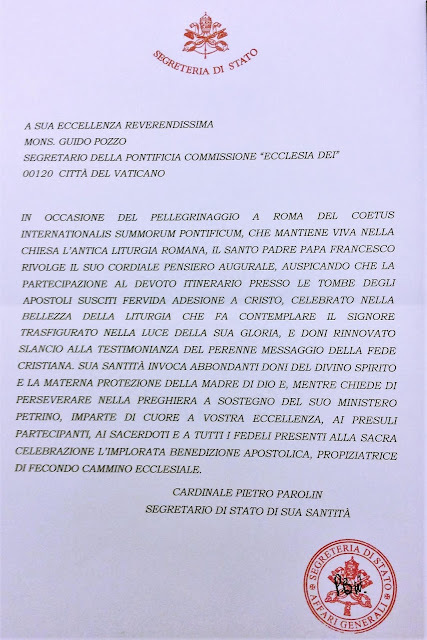 “In his paper to the annual festival of the Personal Ordinariate of Our Lady of Walsingham in London on Saturday 19 September 2015, Archbishop J. Augustine Di Noia OP, Adjunct Secretary of the Congregation for the Doctrine of the Faith, presented what might be understood to be the primary theological rationale for the liturgical provision of the personal ordinariates erected under the auspices of the apostolic constitution Anglicanorum cœtibus. 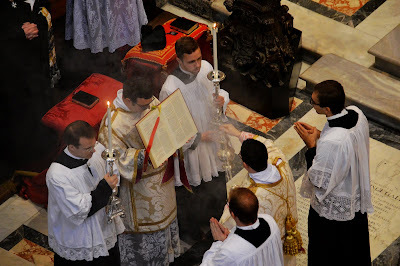 Archbishop Di Noia is well placed to make these observations, both as one who was intimately involved in the evolution of the personal ordinariates (even before they came into existence) and latterly as the Chairman of the Interdicasterial Working Group Anglicanæ traditiones, which was formed in 2011 to compile the liturgical provision mandated by Anglicanorum coetibus III. 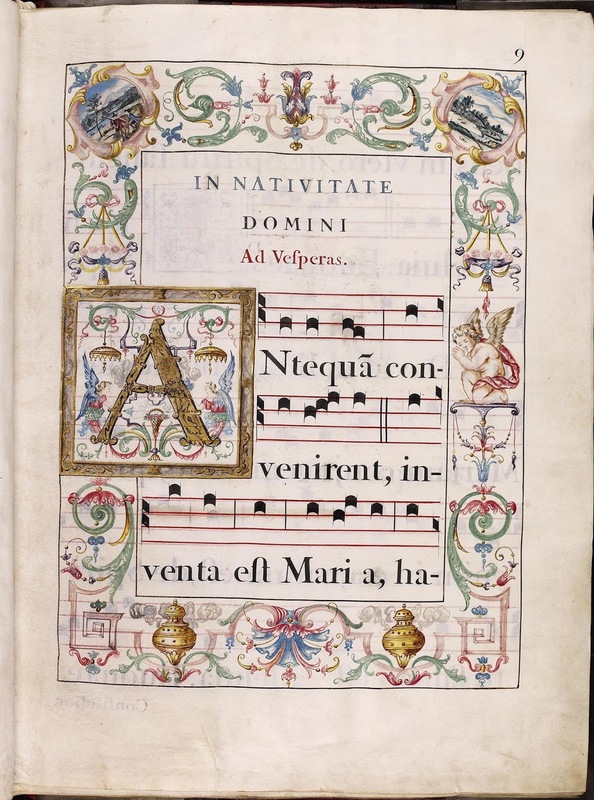 “His paper, which will be published together with other writings on this subject in a forthcoming edition of Antiphon and is available to listen to above, makes a number of significant points. I wish here to deal with the first, which I consider to be the most pressing and which, in a certain sense, must be addressed before all others. 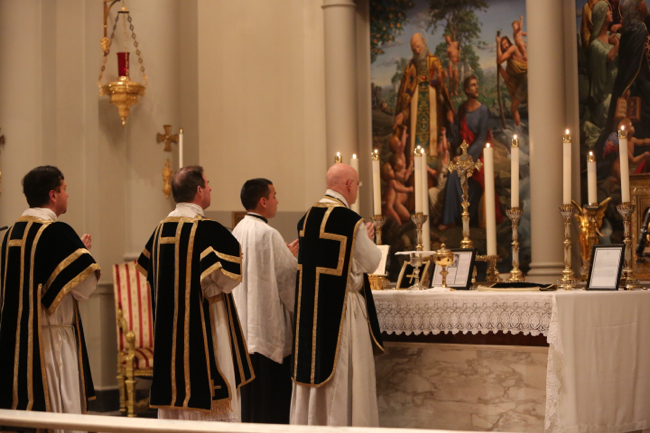 Subsequent points include the pastoral significance of the liturgical provision of Divine Worship as a sign of the Church’s solicitude and concern for the salvation of souls. 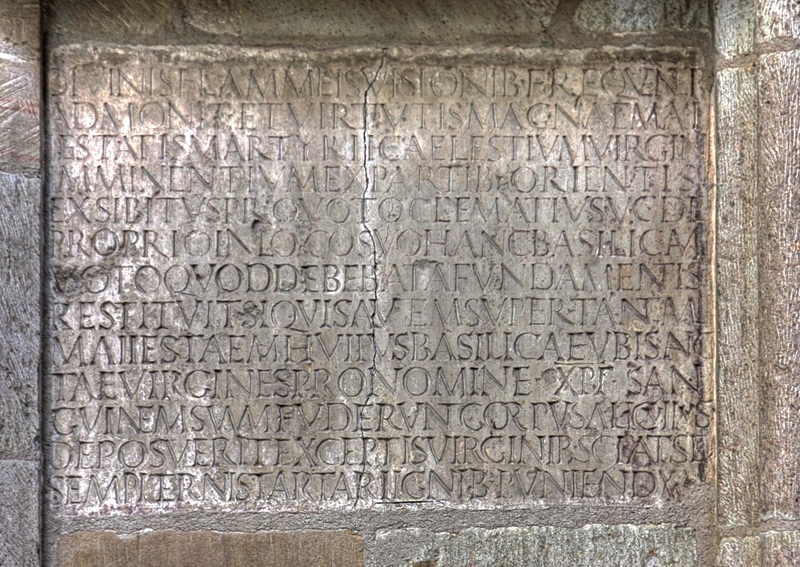 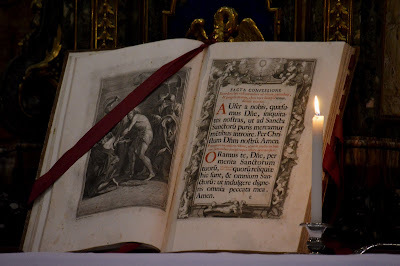 We are also presented with the historical weight that must be given to the promulgation of liturgical texts forged in the crucible of the sixteenth century, by the Apostolic See, and the ecumenical importance of the Anglican patrimony, as it is to be lived out in the personal ordinariates. 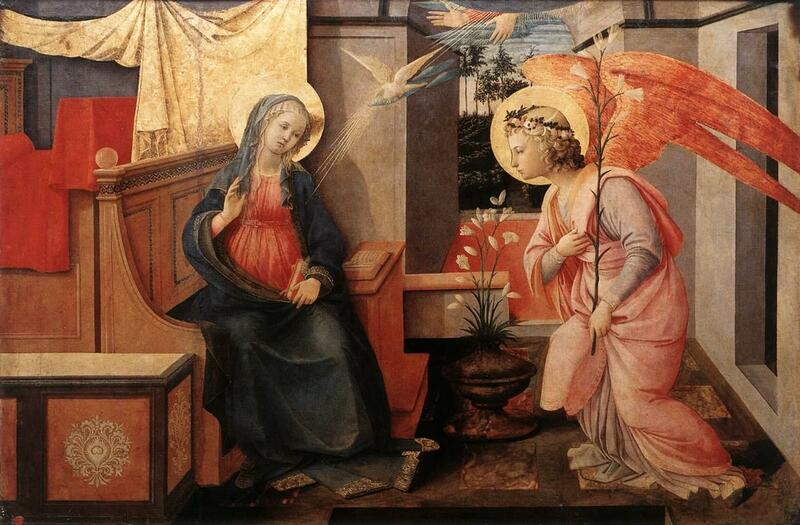 But before these can be effected and realized, a first principle—the subject of this post—must be understood. 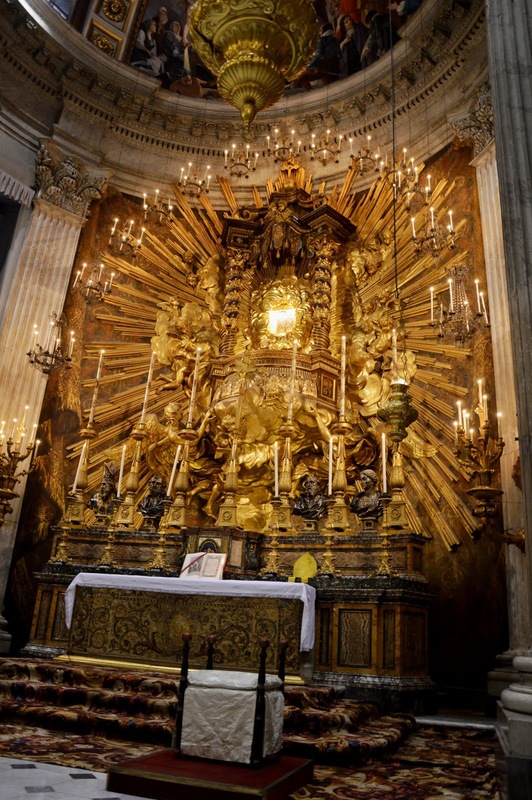 “With regard to this internal importance, Archbishop Di Noia says, ‘Just as it would be unthinkable to describe the Catholic Church without reference to its liturgical and sacramental life, so too it would in some sense be for every ecclesial body. 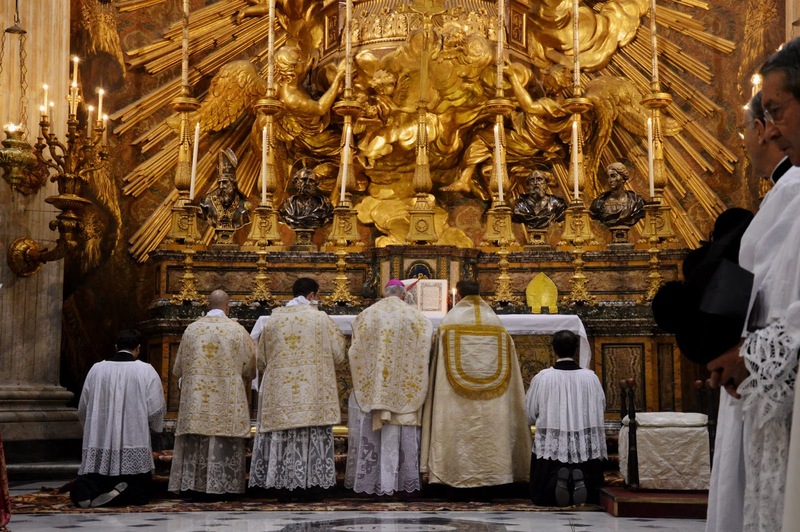 The manner in which an ecclesial community worships uniquely expresses its inner life.’ This is important. 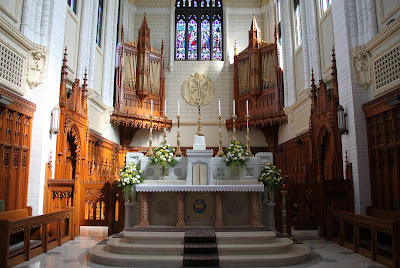 Although there are certainly other elements of the Anglican patrimony, other than liturgical, it is this liturgical patrimony which provides the starting point for the consideration and authentic implementation of these other concerns. 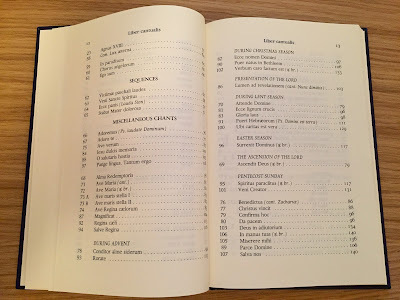 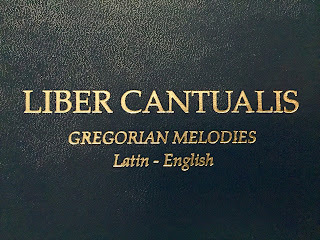 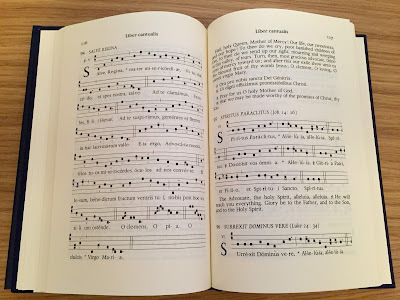 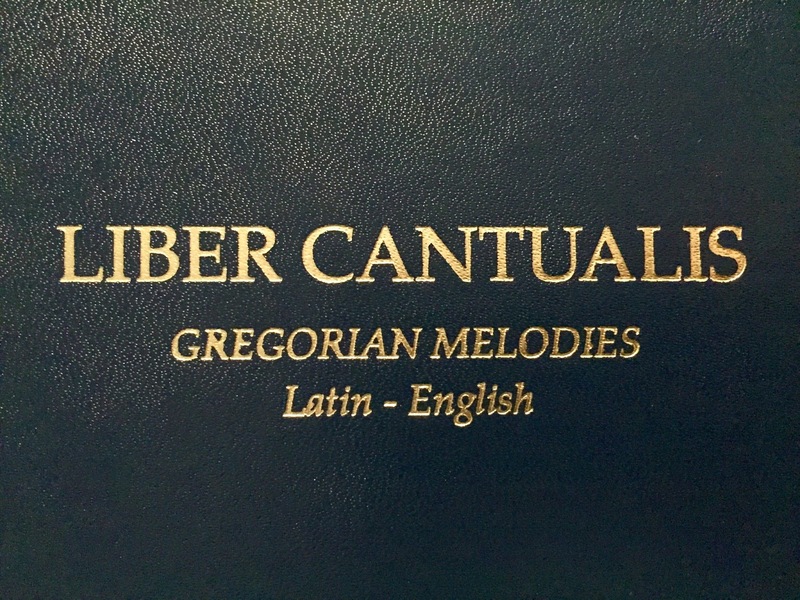 It is in the actual liturgical texts promulgated in Divine Worship that the personal ordinariates reveal their true purpose, and fulfil the desires expressed in Anglicanorum coetibus. If this is so, we must ask with real honesty if an ordinariate community or parish which does not celebrate the liturgical rites of Divine Worship as the very heart and soul of its existence, can be said to be living, in an authentic way, the ecclesial existence and vitality so generously extended to us by Pope Benedict XVI in Anglicanorum coetibus. 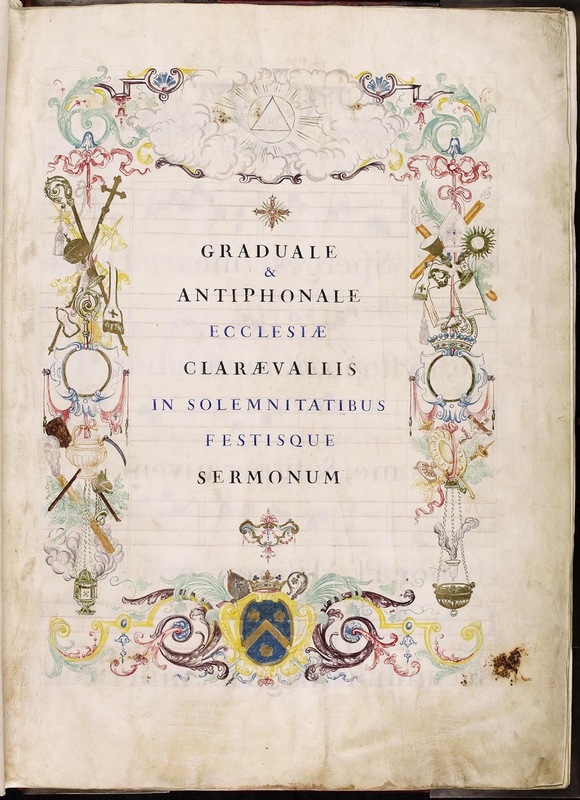 Indeed, as I have suggested before, the provision of personal ordinariates as ecclesiastical circumscriptions, seems to make sense only with the full and unswerving embrace by their members of the Anglican liturgical patrimony, now codified and approved and promulgated by the Apostolic See in Divine Worship. “Furthermore, as Archbishop Di Noia points out, ‘The institutional importance of Divine Worship for the ordinariates is considerable. More than simply giving the ordinariates an outward distinctiveness that creates a profile for their parishes in a sea of Catholic parochial life, Divine Worship gives voice to the faith and tradition of prayer that has nourished the Catholic identity of the Anglican tradition.’ In other words, whilst other elements of the Anglican tradition are by no means insignificant, it is only possible to make sense of these if first we have attended to the liturgical life given us. If the liturgical life of an ecclesial structure ‘uniquely expresses its inner life’, how can it make sense, on the one hand, to downplay the proper liturgical rites attributed to the personal ordinariates whilst, on the other hand, seek to promote other elements of the Anglican patrimony? 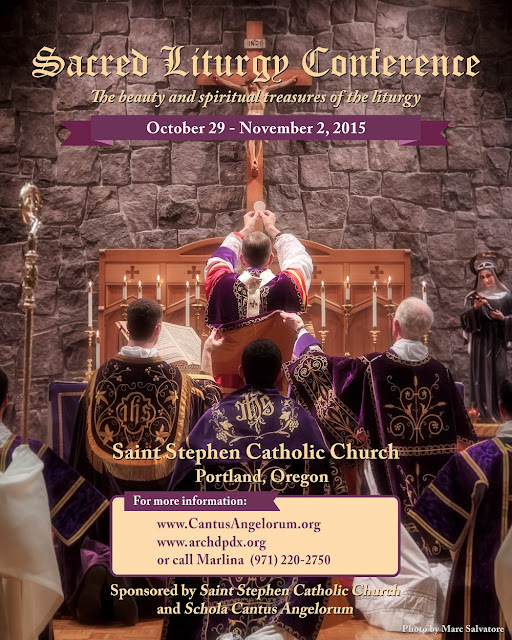 The liturgical rites and texts are a priority. Divine Worship is an essential element. 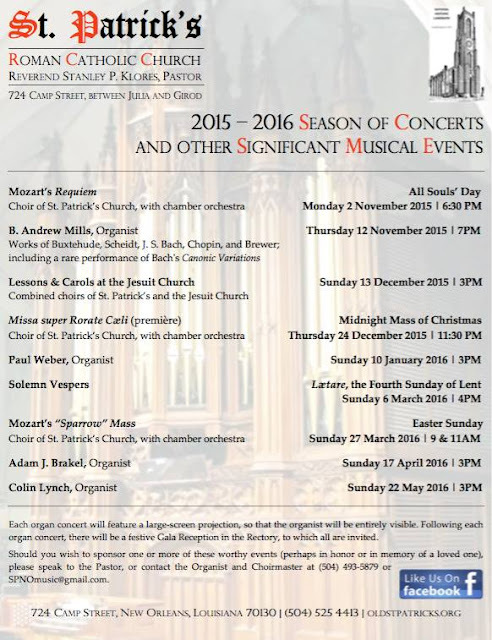 The London Chapter of Juventutem has recently announced a new, regularly scheduled weekly sung Mass on their blog. The first of these will be celebrated tomorrow. “By kind permission of the Rector, we are delighted to announce that as of the 21st October, we will be having a weekly Sung Mass in the Extraordinary Form at Our Lady of the Assumption and St Gregory, Warwick Street, just off Piccadilly. 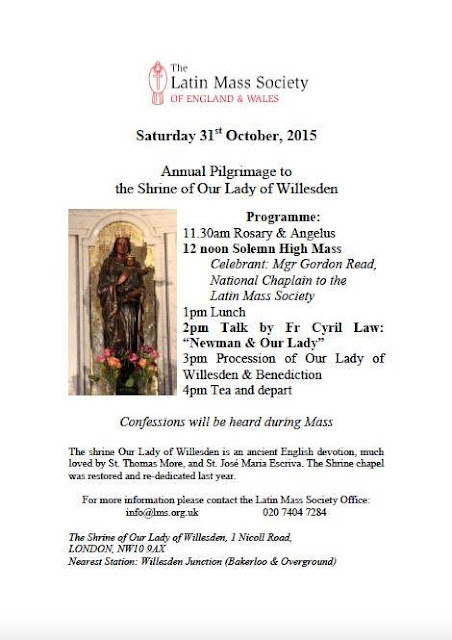 On October 31st will be held the third annual pilgrimage to the Shrine of Our Lady of Willesden, which Juventutem London is organizing for the first time, together with the Latin Mass Society of England and Wales. 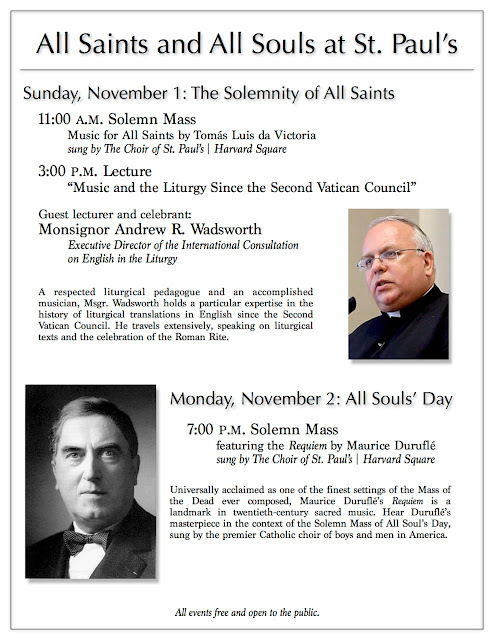 Details of the events in the poster below. 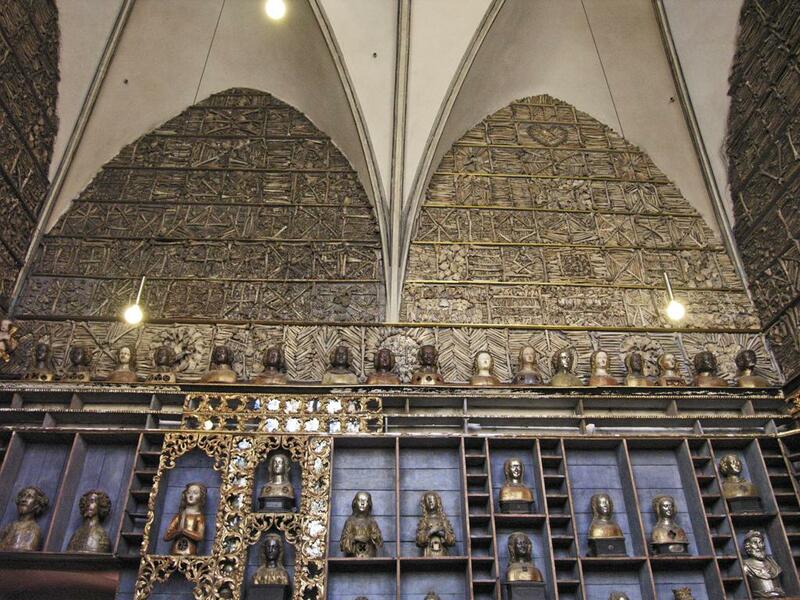 Click here for more information about the shrine. 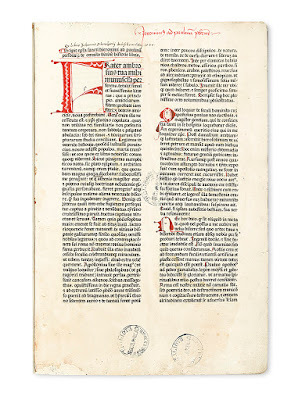 In an article last Thursday, the New York Times reported that St. Charles Borromeo Seminary is selling approximately 250 rare books at auction on October 27, through Swann Auction Galleries in New York City. 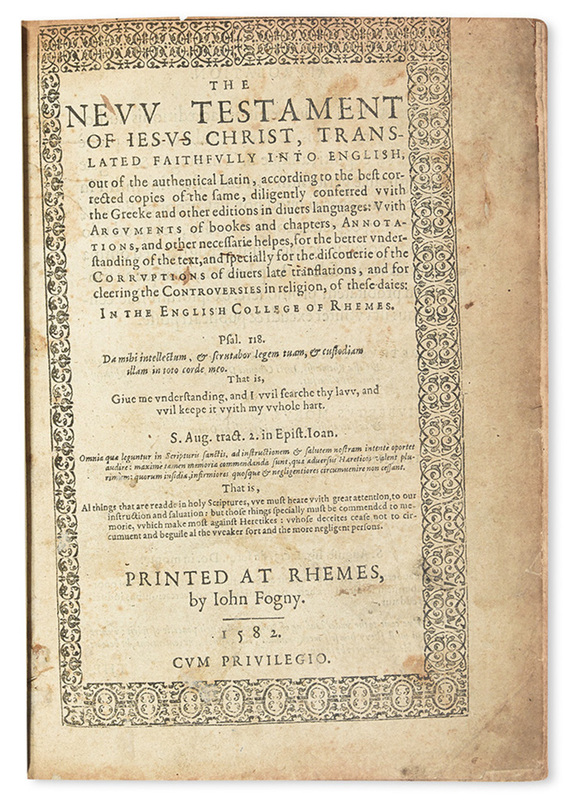 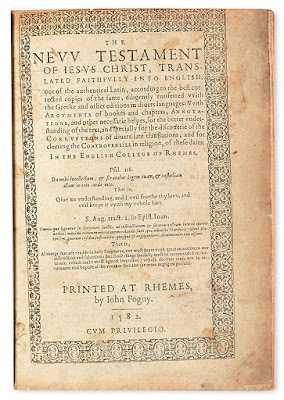 The sale follows the auction of two dozen of the seminary’s books in an Americana auction last month. 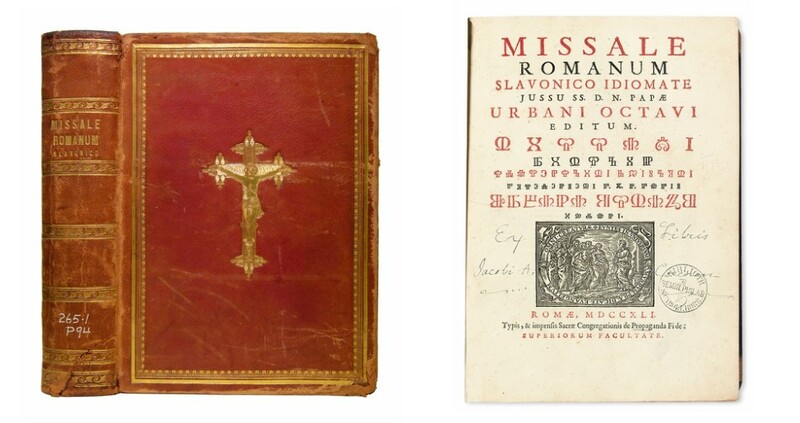 The upcoming auction caught my eye on Thursday when listings from the auction catalog started showing up in my eBay feeds set up to find listings for Eastern Rite liturgical books. 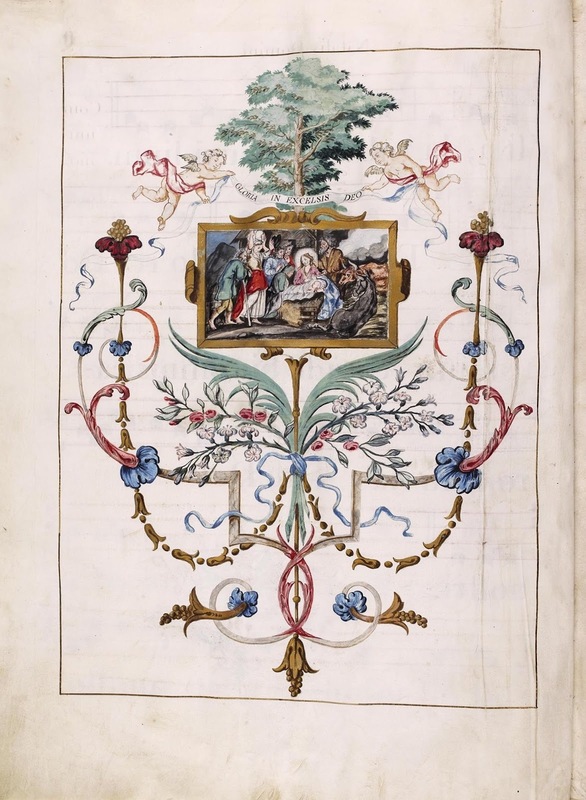 The image above is a Menologium Graecorum, which contains proper texts for the Byzantine rite in Greek and Latin, edited by Cardinal Annibale Albani and published at Urbino in 1727. 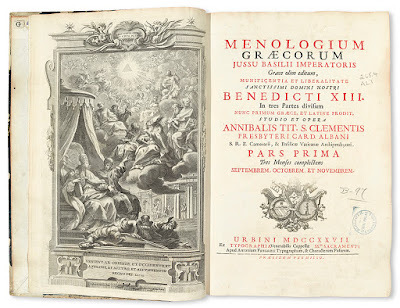 The auction also includes two Maronite books  , a Syro-malabar book, a number of other Greek Orthodox books, and many other Latin rite books, including a “near miniature” 1734 book of the day hours for the Canons Regular of the Lateran. One of the more valuable items in the auction is an Italian 14th century vellum manuscript of the Breviarium Romanum, pars hiemalis, estimated at $8,000 to $12,000. Of particular interest to New Liturgical Movement readers, based on their past interests, may be this Glagolitic missal, published in Rome in 1741. At least one modern liturgical book is found in the action, a richly bound lectionary for the revised Roman Rite. 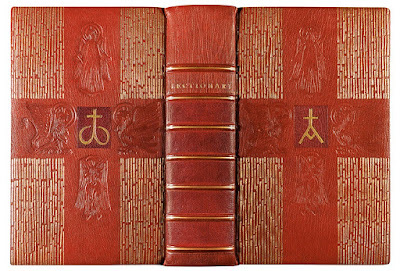 The custom binding and slipcase was commissioned by the seminary from artist Fritz Eberhardt (1917-1997), described as one of the finest bookbinders of the 20th century. 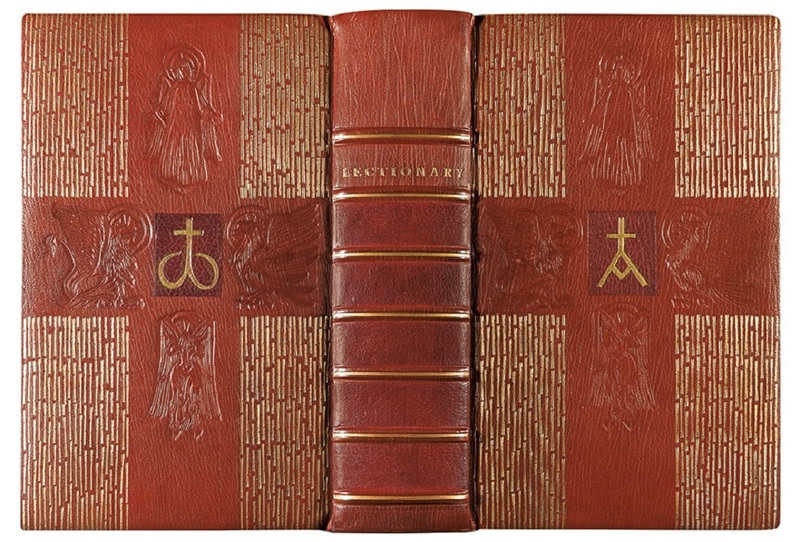 The catalog describes it as “brown morocco gilt- and blind-stamped to cruciform design with symbols of the four Evangelists surrounding red morocco center onlay with gilt alpha on front cover and omega on rear cover, red morocco onlays on spine, wide turn-ins gilt-tooled with irregular lines; gilt edges gauffered to ornamental pattern; contents clean; suede-lined linen slipcase with onlaid brown morocco spine panel blind-stamped with the Evangelists’ symbols.” The lectionary is the 1970 American version utilizing the Revised Standard Version Catholic Edition. 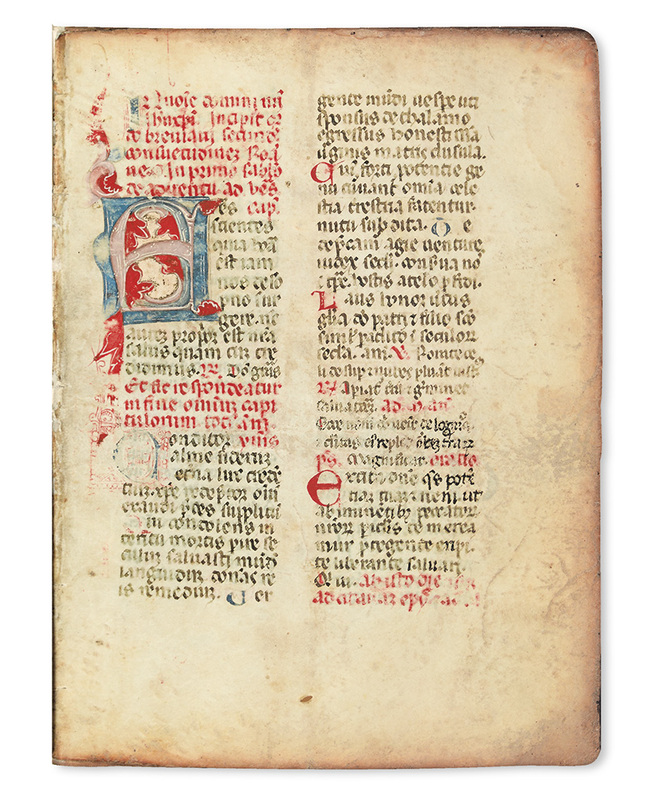 Non-liturgical texts are also among those being auctioned. 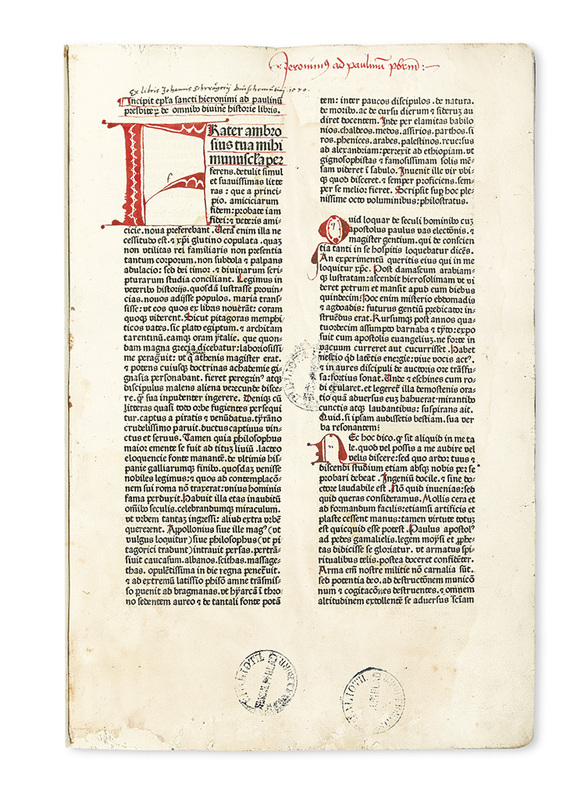 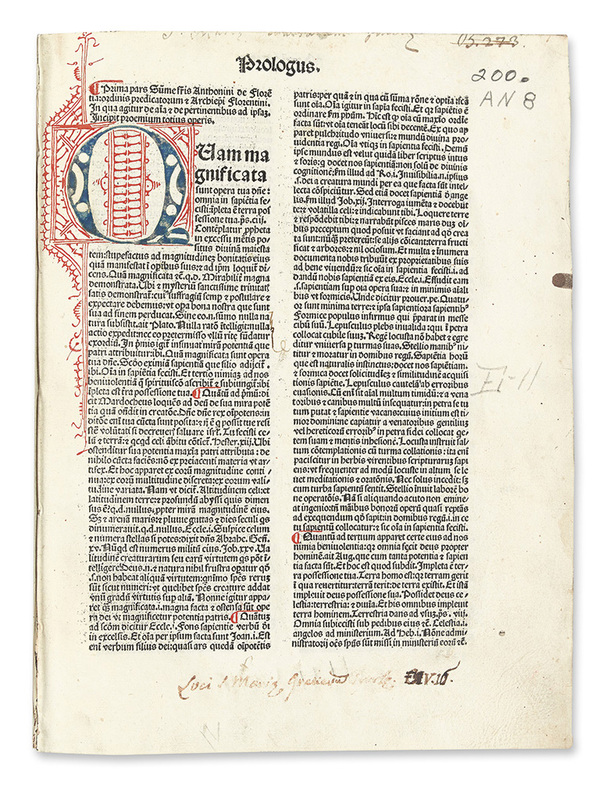 The New York Times article highlights a “vellum Bible published in 1477 (estimated at $10,000 to $15,000) [that] has a bookplate from a Bavarian monastery,” according to the auction house, “the Augustinian monastery of St. Nicola at Passau, Bavaria.” An article at Fine Books and Collections magazine notes what they see as some of the other important non-liturgical texts. 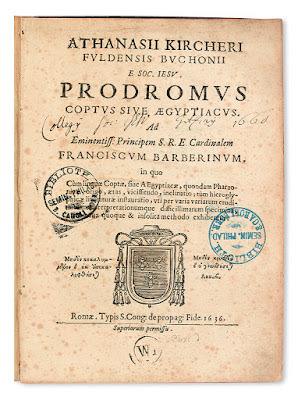 and Athanasuis Kircher’s Prodromus Coptus sive Aegyptiacus, which is described as “the first European grammar of Coptic.” It is one of two Kircher books from St. Charles in the auction and one of several early grammars or dictionaries of non-European languages. 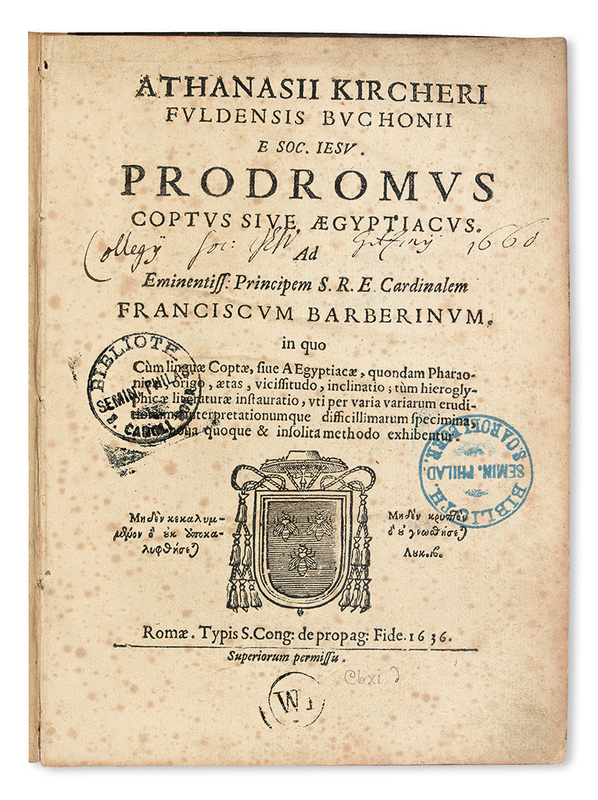 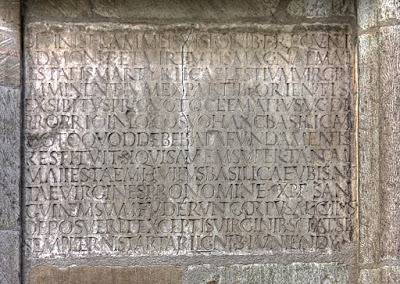 Particularly interesting to me is a 1502-03 edition of the works of Pseudo-Dionysius with “Latin translations by Marsilio Ficino and Ambrogio Traversari with commentary by Hugh of St. Victor, Albertus Magnus, Robert Grosseteste, and others; edited by Jacques Lefèvre d’Étaples.” The complete catalog is available on the web site of Swann Auction Galleries. 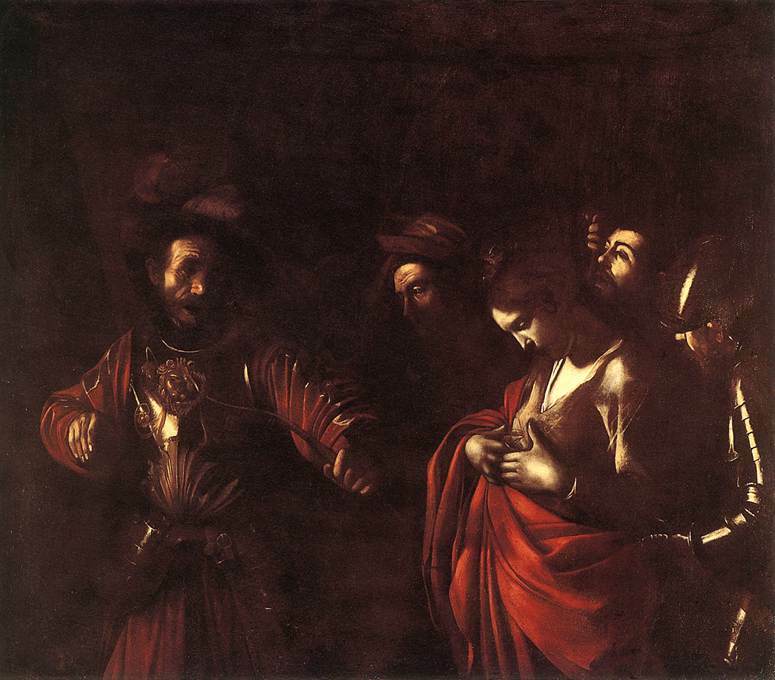 Saint Charles Borromeo’s efforts to raise money by deaccessioning parts of its holdings have not been entirely successful. 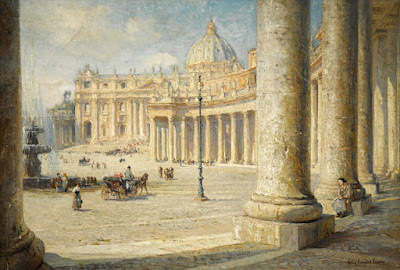 When the school attempted to auction a painting of Saint Peter’s Basilica by Eakin’s student Colin Campbell Cooper at Bonham’s in May, the picture failed to sell. A seminary official told the Times it has been returned to the seminary. 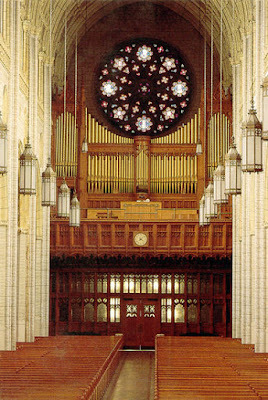 Samuel J. Howard writes from New York City, where he sings at St. Michael's Russian Catholic Church and sings and serves at the Church of the Holy Innocents. 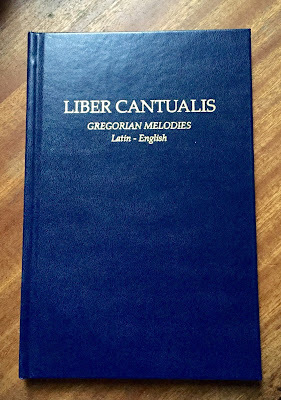 (Twitter: @Jahaza) Our thanks to him for sharing this article with our readers.